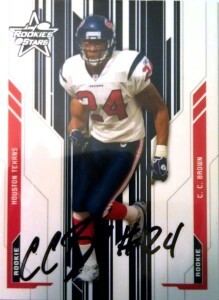 In 2005, CC Brown was drafted by the Houston Texans out of Louisiana-Lafayette, where he was twice decorated as an All-Sun Belt player. A good special teams performer and run supporter who had no problem laying down the wood, CC was definitely an enforcer at the line of scrimmage. Although lacking in pass coverage, Brown started right out of the gate for the Houston Texans his rookie year splitting time at both free safety and strong safety. He’d record 54 tackles, 1 forced fumble, and an interception in 13 games. The Texans dropped to 2-14 that season and fired head coach Dom Capers. The team converted to a 4-3 defense as Gary Kubiak was brought in to replace Capers. 2006, was Brown’s best year statistically, with 67 tackles, a sack, a forced fumble, and an interception. Although 2007 brought a slight dip in CC’s stats, he’d still manage a pick and 64 tackles. A broken arm in late September, meant he lost most of the 2008 campaign to injured reserve. The Texans elected not to resign him for 2009, comfortable that Eugene Wilson and Dominique Barber were going to adequately replace him. CC signed with the New York Giants in 2009. He played one season for Big Blue, starting 7 games, making 49 tackles and 3 forced fumbles at free safety. He’d then jump over to the Lions and Jaguars for a season a piece before retiring after the 2011 season.